My wife sat in kitchen the other morning and a Blue Heron flew over and landed in neighbour's yard beside us. This is January 2011, and we live in London, Ontario. Thanks for the information - we currently don't have a section of our website about the Blue Heron, and I'm not sure whether this bird migrates south for the winter or not. Perhaps one of our readers will know the answer! 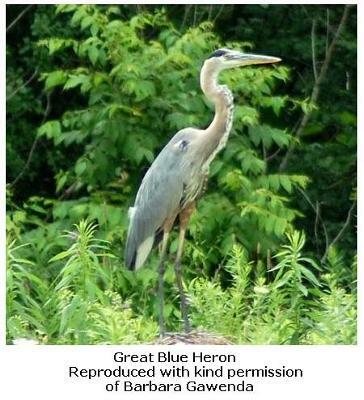 If you know whether the Great Blue Heron is migratory or not, please let us know - thanks! I sighted a Blue Heron in flight today and I too am amazed that they stay for the winters, but they do. Also to my surprise this year my spotting of a Robin on January 3rd and have seen one just about every day since, and last Sunday, January 8th, I had eight Robins under my big evergreen trees. I put out two trays of dried cranberries and cut up apples for them as they were pecking at some old apples I had thrown out in the fall. This is a very strange thing to see this early in the year. I live near Cornwall, Ontario, and my back yard is always full of birds that I feed. This morning a Northern Flicker, which I don't think I have ever seen in winter, was in the tree. love to watch and feed the birds. I saw one last week (end of January 2011) drinking out of the Etobicoke Creek, here in Brampton. Maybe they don't all migrate?